There are tons of Exotics weapons hidden away in the corners of Destiny 2, but which one stands head and shoulders above the others? In this Destiny 2 best Exotic weapon guide, we'll be answering that question in detail. In case you need anything else on Destiny 2 that isn't about Exotic weapons, then make sure to check out our Destiny 2 guides walkthrough hub, where you can find a complete rundown of everything to do in the European Dead Zone, as well as every type of Crucible match you can enter. In case you weren't aware, having higher level items like Exotic weapons can actually increase your overall Power level for your character. 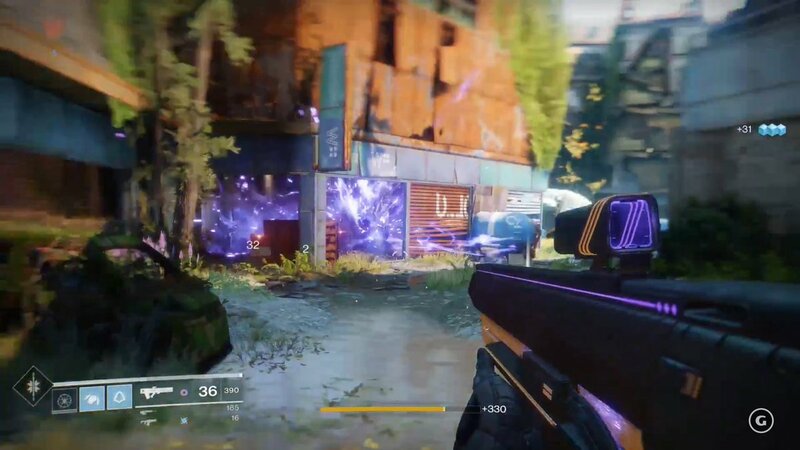 This Power level is separate from your main character level, and effectively acts as a test as to whether you can enter endgame modes like Nightfall Strikes and Raids. 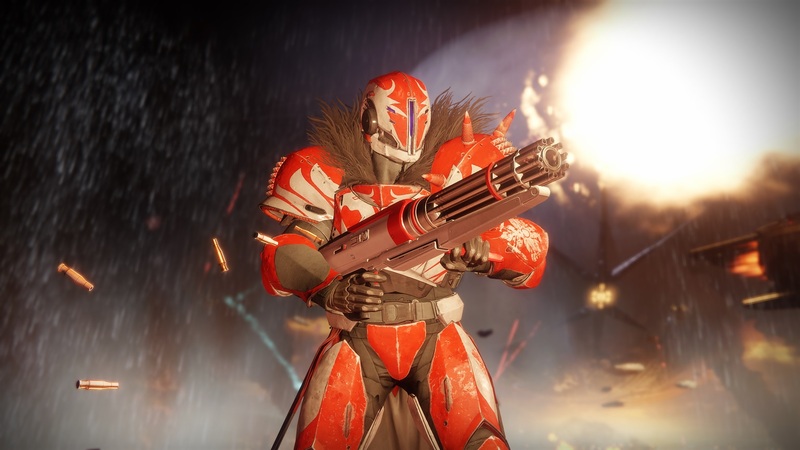 So, if you want your character to reach a Power level of 280 or above, you're going to have to get your hands on the best Destiny 2 Exotic weapons that you can find. With every Destiny 2 Exotic weapon, we'll list the perks that each weapon comes with (if we can determine what they are), as well as a general guide on how to obtain the specific exotic weapon. The latter information will unfortunately only be available once we've spent some time with Destiny 2. 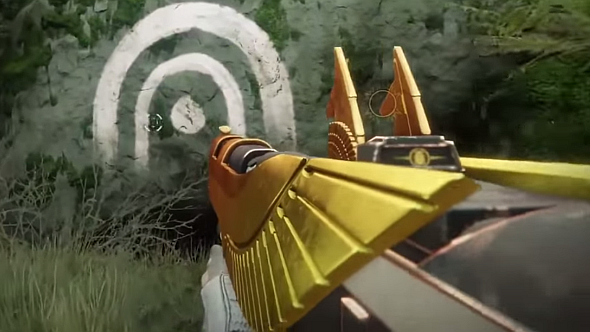 MIDA Radar - Radar stays active while aiming down the sights. 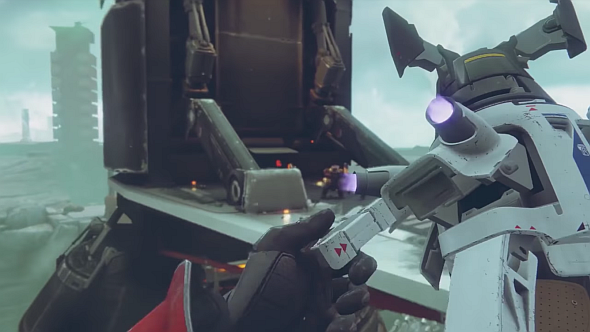 The MIDA Multi-Tool is actually one of the few exotic weapons that returns from the original Destiny. It was a fan favorite back in the original game, and it should be among the best rifles available in Destiny 2. Rat King Destiny 2 Exotic Weapon - Best Weapon in Destiny 2? Rat Pack - This weapon becomes stronger when nearby allies who also have the weapon equipped. Stacks up to six times. Smallbore - Slightly increases range and stability. Tactical Mag - Slightly increases stability, reload speed, and magazine size. Vermin - Reloading after a kill grants a brief period of invisibility. Smooth Grip - Slightly increases stability and handling speed. The Rat King is built for team play in either the Crucible or Raids, especially when you consider the power that Rat Pack could have if every team member were to equip it. Accomplice - Kills with this weapon refill the ammo of your equipped Energy weapon. Combat Grip - This weapon causes much less vertical recoil. Sturm feels like it really comes into its own if you have the sidearm Drang equipped, but it looks set to be a pretty powerful pistol even without its counterpart. Payday - Grants a larger magazine and increased accuracy while firing from the hip. Polygonal Rifling - Increases stability. High-Caliber Rounds - Slightly increases range, shots from this weapon knock the target back. Business Time - Holding down the trigger boosts damage and rate of fire, and picked up ammo is automatically loaded into the magazine. Composite Stock - Slightly increases stability and handling speed. Sweet Business was an Exotic weapon present back in the Destiny 2 beta, so we can fully expect it to already be a fan favorite heading into the full game. Harsh Truths - Fires a five round burst, gain health regeneration and increased movement speed when a nearby ally is killed. Corkscrew Rifling - Slightly increase range, stability, and handling speed. Alloy Magazine - Faster reloads when the magazine is empty. Last Stand - Improved weapon performance when the player is the last one alive in a Fireteam. 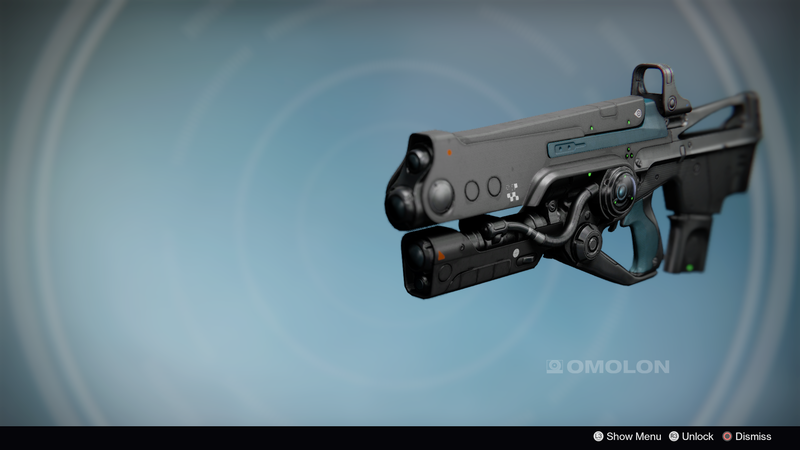 This flashy pulse rifle is certain to catch the eye of players while out in and about in the Farm, or even while taking down opposing team members in the Crucible. Cold Fusion - This weapon shoots a steady beam of cold energy. Enhanced Battery - Increases magazine size. Longest Winter - The longer Coldheart's beam is on an enemy, the more damage it does. Hand-Laid Stock - Increases stability. There's a catch with this unique weapon: it's a pre-order exclusive item, and will only unlock for every else playing Destiny 2 on December 5, 2017. Until then, all you need to do is have pre-ordered Destiny 2 to get hold of Coldheart. Delayed Gratification - Grenade projectiles bounce off surfaces, hold the trigger then release for a delayed explosion. Countermass - Greatly controls recoil, increases stability and handling speed. Implosion Rounds - Increases grenade speed and stability, decreases blast radius. Thin the Herd - Direct hits with this weapon do more damage to shielded enemies, quick kills again grenade-damaged enemies will refill the magazine. Short-Action Stock - Greatly increases handling speed. This powerful grenade launcher deals hefty amounts of Void energy, and will only take up your Energy weapon slot, meaning you're free to equip an equally powerful weapon in your Kinetic weapon slot. Black Hole - The third round in a burst deals higher void damage, with higher recoil. Hammer-Forged Rifling - Increase range. Accurised Rounds - Increases range. Cosmology - Kills with this weapon cause enemy targets to detonate. Fitted Stock - Increases stability, improves recoil direction, slightly decreases handling speed. 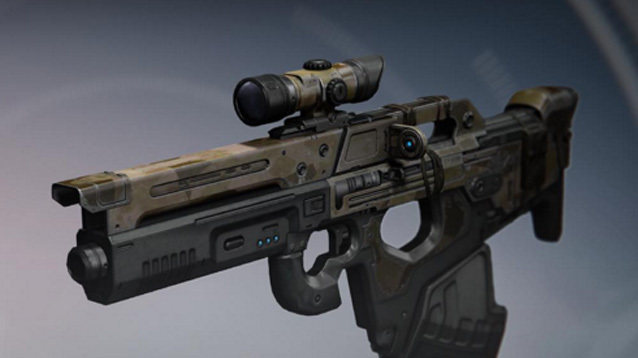 This pulse rifle can operate at an increased distance than most other weapons in the same category, due to its Hammer-Forged Rifling and Accurised Rounds perks. This is a pulse rifle to use when you want to keep your enemies well away from you. Volatile Light - Rounds have no damage falloff, overpenetrate targets, and ricochet off hard surfaces. Polyganol Rifling - Increases stability. Alloy Magazine - Faster reload when magazine is empty. Arc/Solar/Void Core - You can choose the elemental damage that Hard Light deals. Composite Stock - Slightly increases stability, handling speed. With an elemental damage type that you can choose, Hard Light is a weapon that should work well in all situations and against all enemy types, as you can switch between perks on the fly. Arc Conductor - Increases weapon power when you receive Arc damage. Arrowhead Break - Greatly controls recoil, increases handling speed. Superconductor - When Arc Conductor is active, shots fired have a chance to chain lightning between enemies, and return ammo. 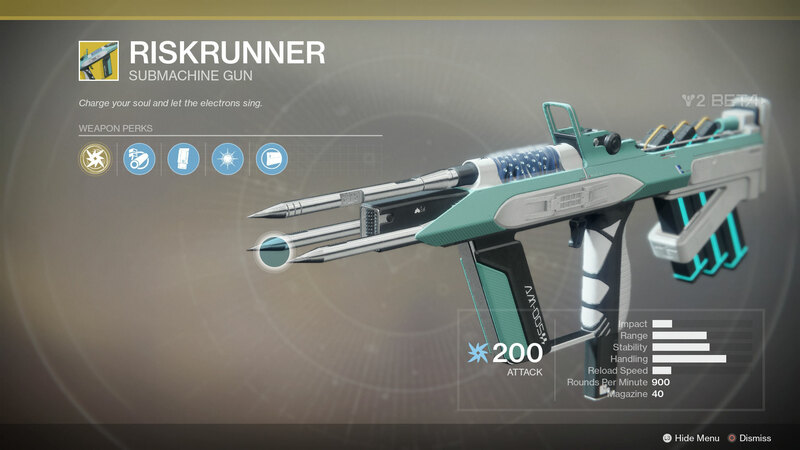 This is a great weapon to use when you know you'll be facing off against enemies with Arc attacks, as we previously found out when we got hold of the Riskrunner back in the Destiny 2 beta. Slug Rifle - Fires Solar slugs which get more powerful when you aim down the sights. Extended Mag - Greatly increases magazine size, decreases handling speed. 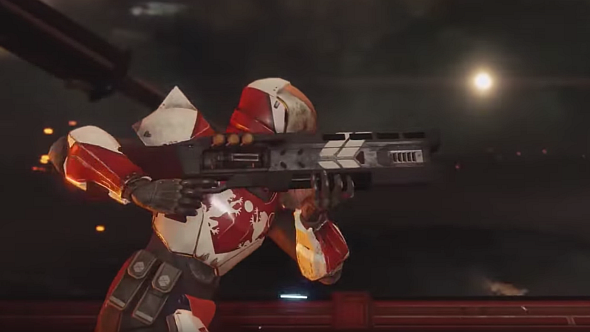 For the Empire - This weapon is full auto, does extra damage to Cabal, penetrates Phalanx shields. This weapon is undoubtedly best used up close and personal, considering that it has no range or general stability perks to help with the recoil that you'll no doubt be encountering. 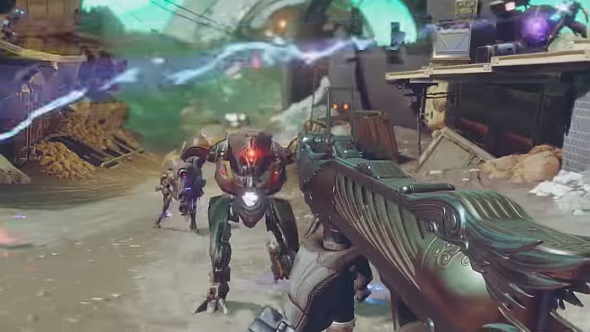 Sunburn - Sunshot fires explosive rounds, and highlights enemies it damages. Chambered Compensator - Increases recoil, stability, direction, slightly decreases handling speed. Sun Blast - Causes enemies to explode with Solar energy. Textured Grip - Greatly increases handling speed, slightly decreases stability. 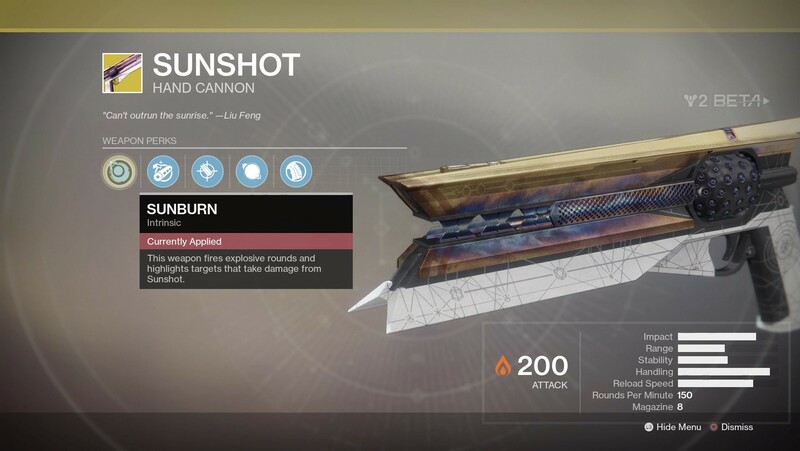 The Sunshot was definitely a fan favorite of those that went with the Hunter back in the Destiny 2 beta, and it looks like this will only continue when the full game launches. Personal Assistant - Aim at an enemy to view their health, and other critical information. Target Acquired - When Personal Assistant is active, DARCI deals more precision damage and has better target acquisition. 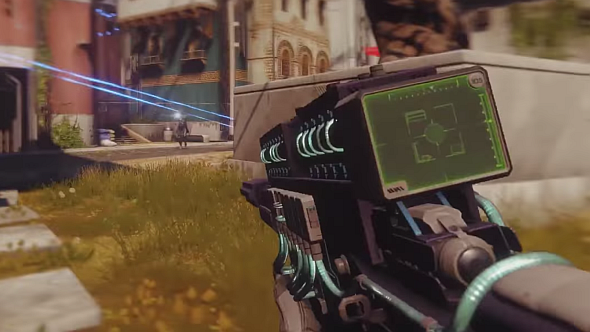 It's hard to fault this Arc sniper rifle, but bear in mind that the target acquisition stat actually equates to aim assist, meaning that Personal Assistant perk is going to give you a big bonus when used. Conserve Momentum - This weapon charges faster if any shots are non-lethal. Chambered Compensator - Increases stability and recoil direction, slightly decreases handling speed. Impetus - Reloading immediately after a kill increases weapon damage for a short time. Fitted Stock - Increases stability and improves recoil direction, slightly decreases handling speed. 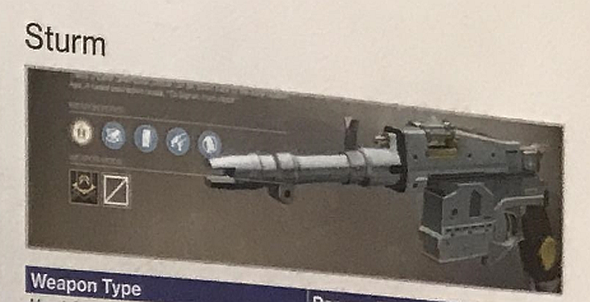 This weapon should be decent when fighting off hordes in modes like Strikes thanks to Impetus, or in Crucible when going up against multiple players at once. Shock Blast - Fires blasts of Arc energy that overpenetrate their target. Full Bore - Greatly increases range, decreases stability and handling speed. Long March - Detect enemies on your radar from further away. 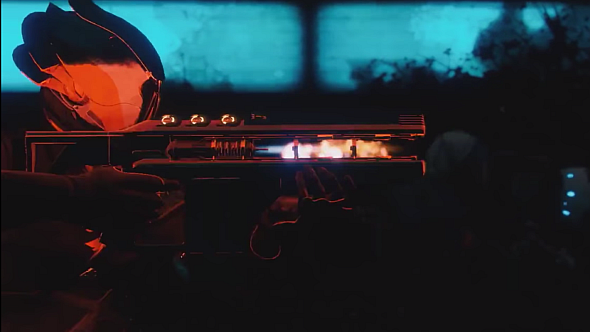 A long range shotgun with an increased radar is sure to work wonders in the Crucible against other players, but bear in mind that Power ammo might be hard to come by in some maps and modes. Prospector - Hold trigger to release grenades, release trigger to detonate all grenades simultaneously. Volatile Launch - Greatly increases blast radius, slightly decreases handling and projectile speed. Augmented Drum - Greatly increases magazine size, greatly decreases reload speed. Full Auto Trigger System - Holding down the trigger will fire this weapon at full auto. 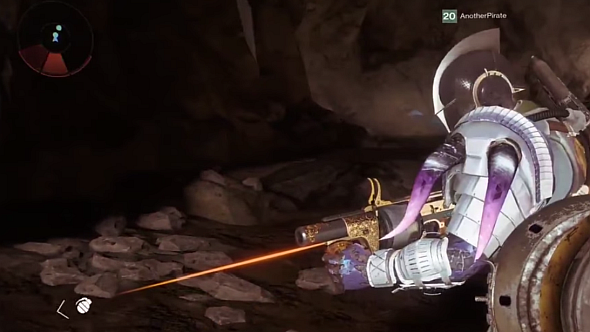 The ability to delay your grenade detonation could make for some nice traps in the Crucible, and a large magazine and blast radius should make the Prospector a valued weapon among players. Repulsor Force - Fires a powerful impulse to push enemies away. Chambered Compensator - Increases stability, recoil, and direction. Slightly decreases handling speed. Particle Repeater - Increases handling speed. The Scientific Method - Damaging an opponent temporarily increases speed and handling. This shotgun should work wonders in both enclosed spaces and areas near the edges of maps, given that it can easily knock back enemies to their doom. Mad Scientist - This weapon fires a volley of rockets. Extended Mag - Greatly increases magazine size, greatly reduces reload speed. Mechanised Autoloader - Automatically reloads picked up ammo. 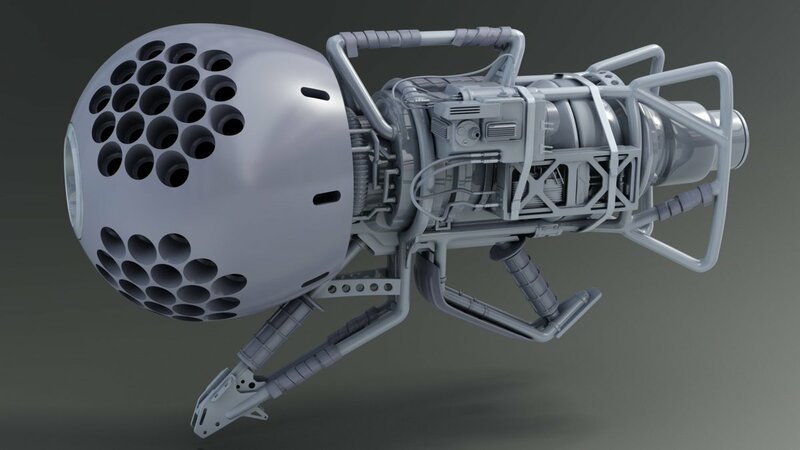 This Arc-orientated rocket launcher can dole out damage with the best of them, being able to fire out plenty of rockets all at once, while others are usually only single shot. You might now know about the best weapons you can get your hands on in Destiny 2, but how do you know when to use a certain type of weapon? For example, when should you use a weapon that can deal our Arc, Solar, or Void damage? The trick with this is to keep an eye on the shield that your enemy has, as well as whether or not a little 'immune' sign comes up next to them when you shoot them. If you see the 'immune' notification, it means you should switch to another weapon that deals out a different type of elemental damage, as your current weapon is having no effect whatsoever. With the shield of your enemy, you'll want to pay attention to the color. 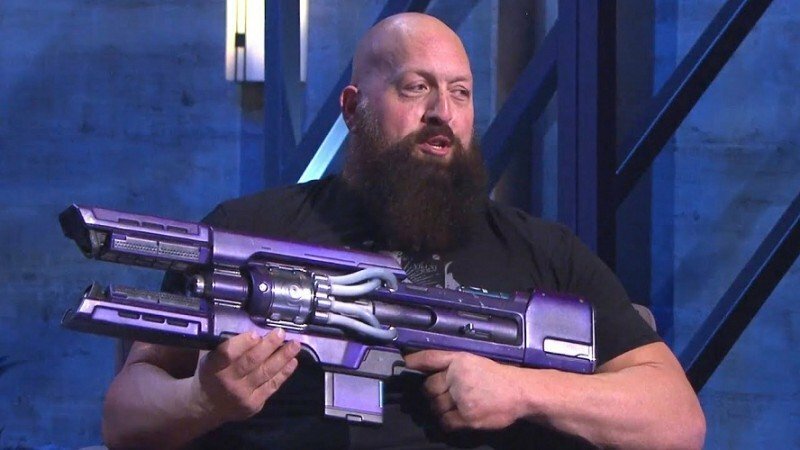 If it's a purple color, then Arc weapons will have no effect, whereas if it's an orange color, Solar weapons will be useless. Basically, if an enemy has a shield color that matches the elemental type of the weapon you have equipped, you should switch weapons immediately. Legendary mods can give your weapons a nice Elemental damage attack boost, should you manage to get your hands on one. 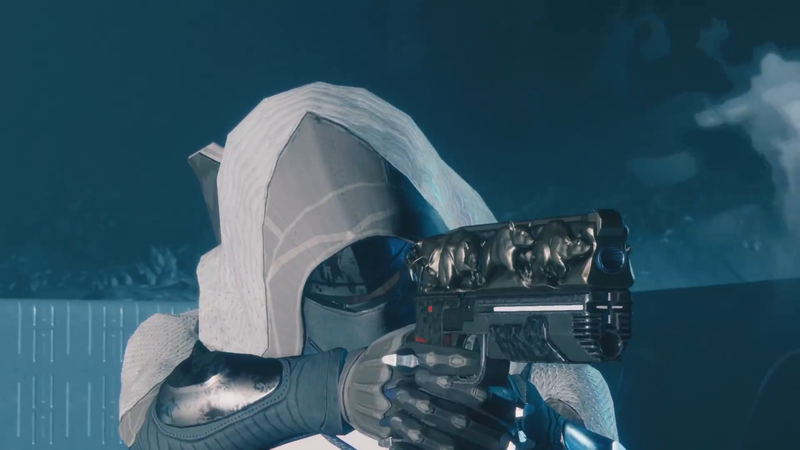 For all you need to know about Legendary mods, as well as where you can obtain them in Destiny 2, head over to our Legendary mods guide. Make sure to check out our other Destiny 2 guides now that we're done with all the Exotic weapons we know of right now. We have guides on every Exotic armor piece in the game, we well as a complete guide to the Crucible.